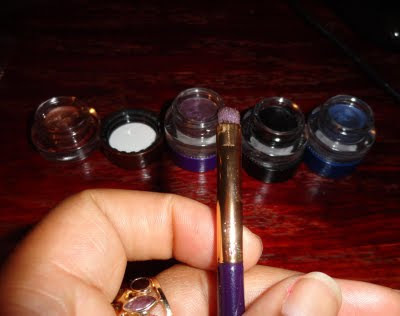 Rarely do I present you lovely ladies with posts about eyeliners but this post is a MUST. For a little over a month I have been fortunate enough to try out the EmphasEyes Amazonian Clay Waterproof eyeliner by Tarte. 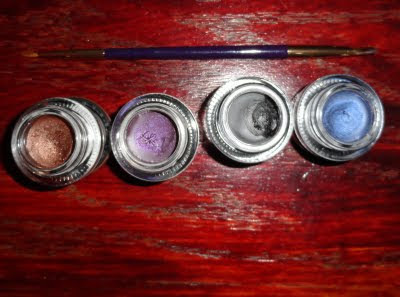 I received the colors bronze, plum, black and indigo as shown in the picture above. Even though I love talking ingredients and all of the nitty gritty details, this time around it must wait because I have to talk about the application and wearability first. I had a wedding shower to attend shortly after I received my Tarte package and I was ready to waltz out of my house bare faced, but I decided to throw on a little mascara. My eyes glanced over at the indigo Amazonian clay pot and it was staring back at me so I thought...why not. I swiped a little across my top lid and I was sold. I felt like my eyes popped instantly, it just played against my skin and brown eyes in the most beautiful way. People complimented my on my dazzling accented eyes and I knew I had a winner on my hands. This eyeliner pot applied so effortlessly, mainly because of its super creamy formulation. I remember purchasing a cream liner from another company and it was rock hard, but such was not the case with this paraben free eyeliner. I attended a wedding recently and I had to rock the blue again- LOVED IT! 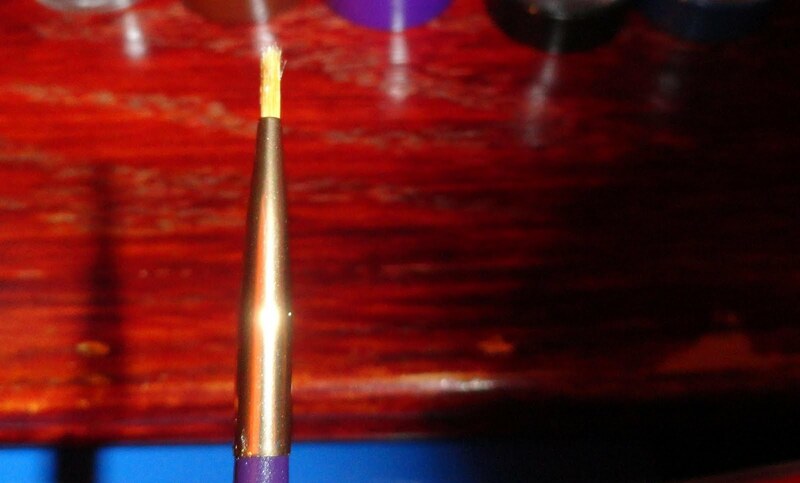 I can not say enough about these gorgeous colors each sold with it's own double sided applicator. As I have learned, the thinner side is great for hitting up that lower lash line, while the wider flat side will allow you to create a bold wide streak across your top lids. I should also mention that I have washed the brushes several times and the hairs remain in tact. I'm not one of those gals who can refer to eye makeup brushes by number but since I washed these brushes several times and the hairs feel as soft as they did when I first opened the box and I experienced no shedding, by my standards these Tarte brushes rock! Each paint post is sold for $22 but I have to say I think it's worth the money, especially when I compare it to some of the "cream" liners I have come across in the past. Here are all of the colors I received swiped across my fist. In the first pic, I am wearing the purple on one eye and the bronze on the other. Feel free to ignore my sloppy application and just focus on these vibrant colors. Oh and for those of you wondering, yes this is a long lasting product. The wedding that I mentioned above, well I did not apply a base but I dabbed on the indigo eyeliner and an eyeshadow from another company. By the end of the night, after sweating out my curls, the eyeshadow was almost nonexistent but the indigo eyeliner was ready to rock out for a few more hours...WHOOOOOOOA. This is marketed as a waterproof eyeliner and I would have to agree because neither sweat nor water was making this eyeliner budge. I had to use my makeup remover wipes to get rid of the eyeliner, and then I followed up with a good facial cleanser to remove the remaining hint of color. In the pic above, I'm smiling with my eyes, can you tell..lol. Next, I rocked out the black and indigo colors. This Tarte line was released to the public this summer so I highly recommend you add these pots to your collection. If I recall a turquoise color was released too, I must find it and OWN IT :-). Maybe it was a limited edition, if so I missed the boat. Now I find myself with a growing interest in eye color (shadows and eyeliners) thanks to Tarte. Have you tried this product, if so what are your thoughts? 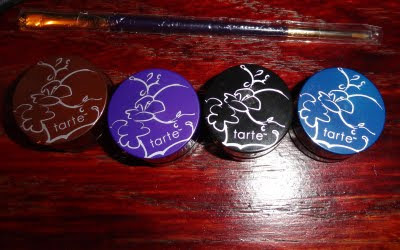 Thanks for allowing me to test these out Tarte!